Sashimi of scallops and daurade. 8, rue Suger, in the 6th Arrondissement. 01 46 34 25 88. Mon–Sat, 6:30 p.m.–11 p.m. The fun at Shu starts the moment you step through the door, a child-size portal on quiet rue Suger that leads to a cool and calm den with stone walls, broad wooden tables surrounded by cushioned benches, and a pristine little kitchen with a counter and a few seats. The menu at this modern Japanese restaurant in a very old building is based around kushiagué—little skewers of delicately fried morsels of vegetables, meat and fish, from taro root to crispy shrimp, delicately seasoned and presented with dipping sauces, coarse salt and lemon. There are three menus, at 38, 48 and 56 euros, with more plates as you spend more. We chose the middle one, called Suzu, which consisted of an amuse, a sashimi course, a seasonal plate, 15 of the kushiagué, a palate cleanser, a choice of noodles or rice, and dessert. The amuse was a delicious little shrimp patty in broth with crispy haricots verts. 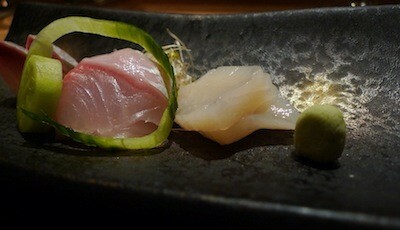 The sashimi were firm and fresh, the milky slices of scallops especially tender and sweet. 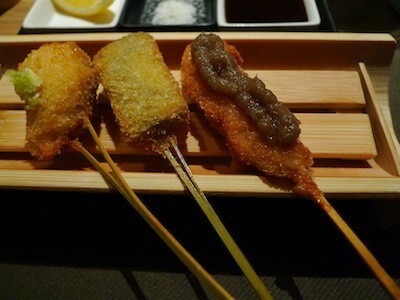 Next came two cubes of perfect sticky rice topped with salty sweet eel and speared by a sliver of cucumber. Then came the main event, the kushiagué: shiitake mushroom, scallops, eggplant, zucchini, filet mignon (of pork) and 10 other little treats. They were presented, 3 at a time, piping hot and never greasy, some topped with a condiment or garnish, some more interesting than others. I found, and my date agreed, that it was too much; after a while the little skewers began losing their individuality and blended into one big fritter in my brain and mouth. Fried-food fatigue had set in. If I go back (and I hope to) I’ll splurge on the 56 euro menu, which actually has fewer kushiagué and more of the other dishes. We ordered one each of the rice and noodles, the rice in a soup with green tea, the inaniwa noodles served cold with dipping sauce on the side. The slippery white strings didn’t look like much but were surprisingly satisfying. Grapefruit gelée studded with cool avocado was a refreshing dessert. There is a short wine list that includes a thoughtful selection of delicate whites. They typically go well with clean Japanese flavors, but sake or even beer would not be a bad idea. In a nutshell: Shu’s small plates and minimalist aesthetic yield maximum pleasure. Price check: Fixed-price menus at 38, 48 and 56 euros. 8, rue Garreau, in the 18th. 01 42 54 23 92. Dinner only; call for details and reservations. Editor’s note: For a gourmet walking tour, check out our DIY downloadable tours.